Did you miss last night’s episode of The Walking Dead (where they finally reveal that Glenn shot J.R., but didn’t kill Laura Palmer) because you don’t have cable and just plan on grabbing a pirated version of it from the Internet? If you’re a Comcast customer who has been flagged a potential copyright violator, your web-browsing experience may be interrupted with pop-up warnings. 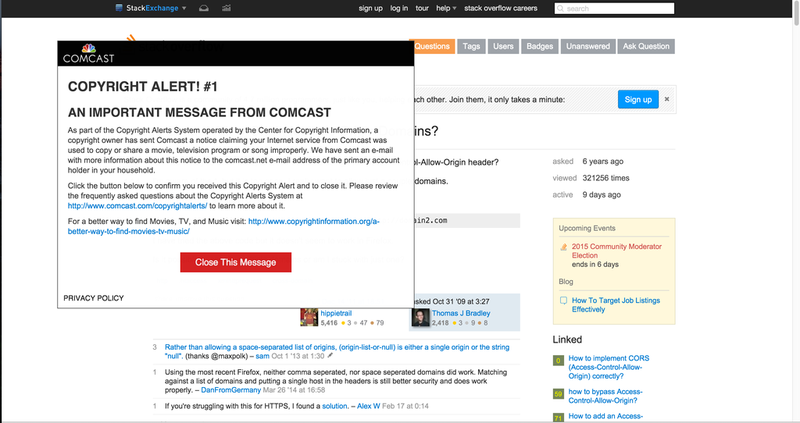 Last week, a developer and Comcast user posted the above screengrab to GitHub, showing how Comcast is now injecting these warnings into customer’s web browsers when they believe that some sort of illegal file-sharing may have occurred. The warnings appear to be an extension of the existing Copyright Alert System, better known as “Six Strikes,” that sends alleged violators a half-dozen “stop doing that” notices until eventually deciding whether to penalize the customer by throttling their data speed or terminating their access. But rather than a letter, e-mail, or phone call, Comcast is stepping into the middle of your browsing of a non-Comcast site to communicate with you. The company tells ZDNet that it outlined its use of such alerts several years back in this white paper. It appears that the notices only show up on sites with standards HTTP connections (as opposed to the more secure HTTPS) are vulnerable to these interruptions. As Neowin points out, there are ways to increase your use of HTTPS, like the Electronic Frontier Foundation’s HTTPS Everywhere plugin for Chrome and Firefox.